As the United States deals with diversity, much of the laws that give a equal playing field and legal recourse to individuals relies on the fourteenth amendment. However, to understand it, we are required to have a knowledge of history, culture and judicial authority as well as some sort of idea behind the extensive debate about slavery and how the ethics of our society was shaped. The existence of the Amendment relates to the issue of race and specifically how America handled slavery as the nation expanded further westward- will the new territories purchased in the Louisiana agreement or conquered during the Mexican-American war be free states or will slavery be a standard norm? What lead to the fourteenth amendment was the Civil War. Up until 1857, the United States had dealt with the tension found in the Constitution regarding freedom and state rights (or slave owners rights) through legislative compromise. When Congress negotiated the Missouri Compromise, the number of slave and free states were equal, with Maine seeking admission as a free state and Missouri forming its bid to join the Union. In the Compromise a geographical line was created in which states admitted to the Union north of it were free, while states south of the line would be slave states. 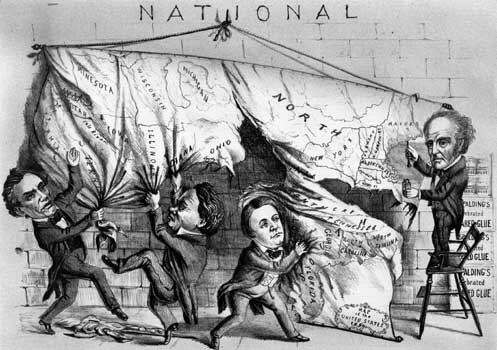 This was a compromise between the northern and southern states as their representatives in congress sought to balance power with the addition of each new territory as a state. However, Thomas Jefferson in a letter to John Holmes stated that this “geographical line, coinciding with a marked principle, moral and political, once conceived and held up to the angry passions of men, will never be obliterated; and every new irritation will mark it deeper and deeper.” What occurred from this compromise were the Compromise of 1850 and the delay of the inevitable civil war. In the Compromise of 1850, politicians tried once again to figure out a way to move forward with territorial expansion to the Pacific Ocean and the formula established in the Missouri Compromise given that California and Texas, both seeking admission into the Union had significant territories above the demarcated lines. In this compromise, Texas saw its territory reduced in exchange for the Federal government take on its debt, thereby entering the Union as a slave state and California’s territorial integrity remain intake and it enter as a free state. The Missouri formula would work, however, in the 1850 Compromise, Southern states saw the passage of the Fugitive Slave Law which required federal judicial officials in all states and federal territories, including in those states and territories in which slavery was prohibited, to actively assist with the return of escaped slaves to their masters in the states and territories permitting slavery. Under these circumstances a slave named Dred Scott brought an action in the federal court alleging that he had become free as a result of residing with his master in Illinois and the Wisconsin Territory. Scott argued that as soon as he set foot north of latitude 36° 30’ he was legally free and could not be kept as a slave in Missouri, a slave state. The Supreme Court saw this as a constitutional issue, suggesting that blacks were not “citizens” within the meaning of Article III and IV of the Constitution, therefore, according to the court; he could not bring a lawsuit in federal courts. But even more surprisingly the Court ruled that the compromise was unconstitutional, that a territory could choose to be a free or slave state without congress limiting because it ceased to be a territory and became a political entity. In fact, the Court reasoned that Congress had simply exceeded its authority in doing so. This conclusion was drawn from the idea that when the Constitution was drafted blacks were considered “as a subordinate and inferior class of beings” not included within the Declaration of Independence’s claim that “all men are created equal”. This finally would lead to the further polarization of American politics and the Civil War. After the Union won the Civil War, the fourteenth amendment was introduced and passed by Congress after former Confederate states began introducing laws that restricted the rights of freed Black Americans. Former Confederate states begin constructing the Black Codes in order to maintain the subjugation of blacks as second-class citizens. In response, northern states introduce the Thirteenth, Fourteenth, and Fifteenth Amendments, Southern legislators unqualified to vote due to their being from states that seceded from the Union, were unable to stop Congressional passage of the Reconstruction Amendments. After passage, former Confederate states were required to ratify the Reconstruction Amendments in order to gain admission into the Union.